"...The set of old Italian arias M-766 is a definite ‘must’....Some of [the arias] are hauntingly beautiful, especially the 'Oblivion soave' from Monteverdi's L'INCORONAZIONE DI POPPEA and Falconieri's 'O bellissimi capelli'....a collector's item to be snatched up, if you manage to get hold of it." “Ezio Pinza was an Italian opera singer, a bass with a rich, smooth and sonorous voice, he spent 22 seasons at New York's Metropolitan Opera, appearing in more than 750 performances of 50 operas. 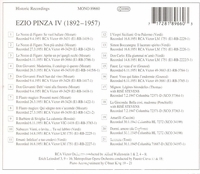 Pinza also sang to great acclaim at La Scala, Milan, and at the Royal Opera House, Covent Garden, London. He retired from the Met in 1948 and embarked on a second career in Broadway musicals. In April 1949, he appeared in Rodgers and Hammerstein's SOUTH PACIFIC, originating the rôle of French Planter Emil de Becque, and his operatic-style, highly expressive performance of the hit song ‘Some Enchanted Evening’ made him a matinée idol and a national celebrity. In 1950, he received a Tony Award for best lead actor in a musical.